There were plenty of spectacular moments during the maiden launch of SpaceX’s Falcon Heavy rocket on Tuesday. It revealed SpaceX CEO Elon Musk’s cherry red sports car. Behind the wheel was a spacesuit-clad mannequin, named Starman. The car glided victoriously away from Earth as David Bowie’s “Life on Mars?” blared on SpaceX’s launch webcast. The car is not on some scientific voyage. This was a test launch, so SpaceX needed a dummy payload — and Musk previously said he wanted it to be the “illiest thing we can imagine.” So he picked his own luxurious Tesla roadster. “I love the thought of a car drifting apparently endlessly through space and perhaps being discovered by an alien race millions of years in the future,” he said in December. The livestream, which was later viewed by millions of people, cut out after about four and a half hours when cameras’ batteries died. Onlookers here on Earth moved on with their lives. But now experts say that probably won’t happen. Jonathan McDowell, an astrophysicist at the Harvard-Smithsonian Center for Astrophysics, says he also got a first-hand glimpse at the data and his analysis lines up with NASA’s. That’s based on current projections, but things can always change. “The problem now is that it’s kind of difficult to predict how the orbit will evolve,” said Marco Langbroek, a space expert who tracks asteroids. By next week, astronomers say, the car will already be too far away from Earth to track with telescopes. So they’re clamoring to get some good shots of the roadster now. 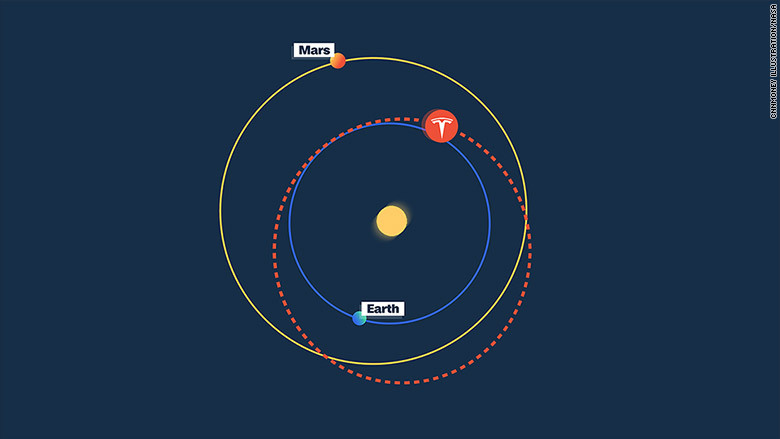 Because of how the car’s projected orbit aligns with Earth’s orbit, astronomers on the ground probably won’t be able to spot the roadster again until late in the 21st century. Langbroek predicts 2073.